Made this last week when we were leaving the liquor store. I was appreciating and making some photos of a classic Volvo parked outside the store when the car owner and his daughter came up to us. He was as excited that someone was loving his car as we were for seeing it. His daughter wanted to tell us that when she rides in the car she gets to have spearmint gum! Next, she wanted to know why I was making photos soI showed her the curving lines of the fins in my LCD viewer. She popped in front of my camera and announced the pictures would look better if she was in them. 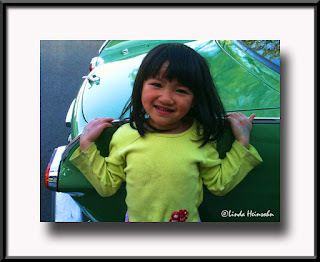 With the consent of her dad we have,"Spearmint Girl With Classic Volvo." What a bright, lovely photo. I'm sure Dad & daughter both loved it! Great photo & story. Thanks for sharing. Thanks, Judy. I felt relieved her dad said it was ok to take her photo as I'm so hesitant to take photos of other people's children these days. The car's license plate said, "SPRMNT."